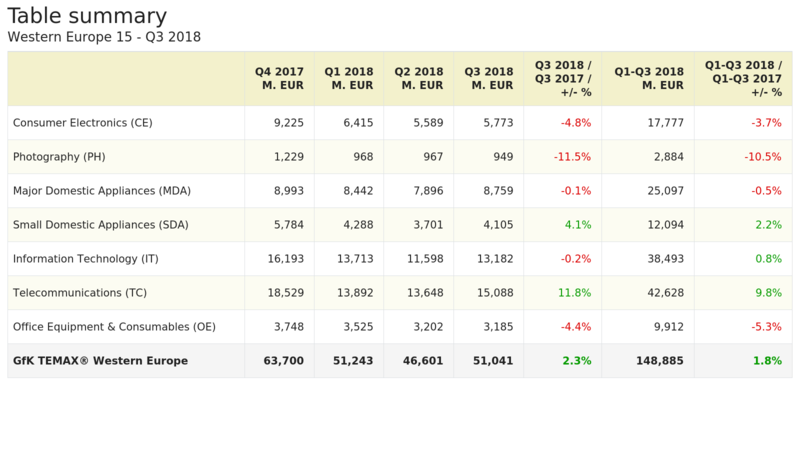 According to GfK Temax, in Western Europe markets Technical Consumer Goods (TCG) in the first nine months of 2018 recorded a total turnover of 148,885 million euro, with an increase of 1.8% compared to the same period of the previous year. Choosing the appliances to buy, consumers often prefer the premium versions with high-end features, expecting to live rich experiences. Looking at the single segments, we can see that, besides Telecommunication and Information technology, only small appliances grew, reaching about 12 billion euro, +2.2% compared to the first nine months 2017. Another visible trend is the use of mobile devices for the e-commerce. Major domestic appliances decreased by 0.5%. Connectivity is becoming a normal feature for modern home appliances and consumers are generally looking for it in the devices they buy. Regarding consumer electronics, GfK Temax recorded a negative result, with a revenue that fell by 3.7%, while Photography saw another drop by 10.5%. Among the Western European markets, Technical Consumer Goods in Germany saw a little decrease of 0.2% in the first three trimesters of this year. Major domestic appliances reported a fall of 1.6%, while small appliances grew by 1.4%. TCG reached an overall revenue of 41.6 billion euro. Also France recorded a little decrease of 0.3% of the total technical consumer goods market, with a fall of major domestic appliances of 0.4%, but an increase of small appliances of 3.6%. Italy, instead, show a positive trend, with a total revenue of TCG increased by 1.8% from January to September 2018 (compared to the same period of 2017), although negative results for major domestic appliances, that recorded a decreased of 2.3% but a growth of 3.8% for sell-out of small domestic appliances.